Briefly! Table Tools is a multi-optioned tool that allows far easier filtering of data in a Table. It allows easier manipulation of the results of the filtering. In Excel 2007-2016 we have an option on the Ribbon on the Insert tab named Table. 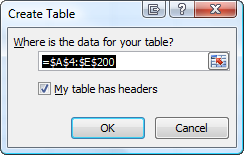 If you select a cell in your normal range and press the Table button it will show you this dialog. But as always I want more options so I created a small add-in that adds a tab next to the Design tab named RDB Tools with a few more options. 1: Insert the Sort column named "RDB Sort Column"
Easy if you want to delete the "RDB Sort Column" for example. If you have suggestions or find bugs please let me know.